Artecy Cross Stitch. 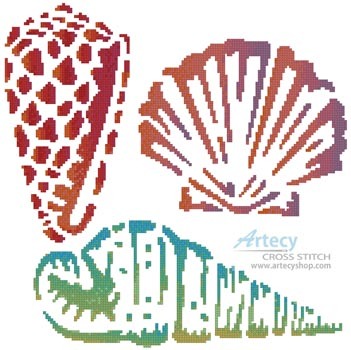 Sea Shells Cross Stitch Pattern to print online. This counted cross stitch pattern of easy to stitch Sea Shells was created from beautiful Artwork copyright of Joni Prittie. Finished size = 10.5" x 10.5" using 14count or 8" x 8" using 18count. Each pattern is approx 80w x 125h or less.